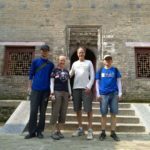 An article by Janine Copple Comments Off on Rambling Different Trails: A Day In The Saddle To Xuchang. 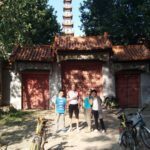 Last week started out started with the prospect of a long-planned ride back to the pagoda at Beichangshediancun with Steve and a student. Those plans were derailed because of work obligations, then the make-up date, Sunday, the student couldn’t go. So what does one do when your one day to ride is up for grabs? Well, go on the longest ride yet, to a new destination, to make up for an inactive week. I couldn’t convince Steve to go with me, he doesn’t get as excited about the long ones as I do. 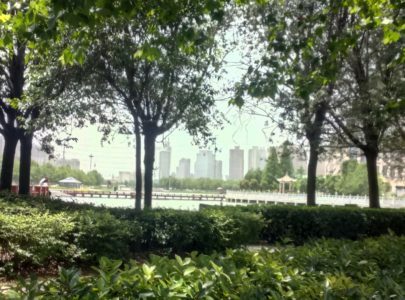 Landscaped parks and lakes line the entrance to Xuchang. 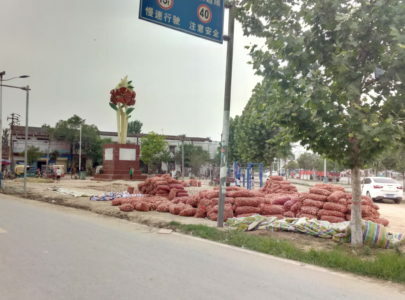 Xuchang is just up the road from Yanling, where we rode to the hot springs for an overnighter last month, and I wanted to see it. It was a capital in The Three Kingdoms period, around 2000 years ago, and has ancient relics, which I couldn’t see due to time constraints. 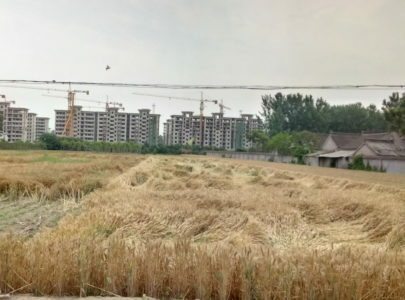 Wheat fields giving way to high-rises in Xihua. I didn’t take back roads this time. 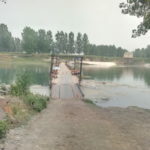 The map indicated the highway was the best choice to save time, and with some construction happening, the through traffic had been diverted, making it better for cycling. Construction crews don’t even try to keep to keep scooter and bike traffic out of construction sites. That would be a lost cause. There’s always a trail around the edge of the busy parts and workers will even wave you through. 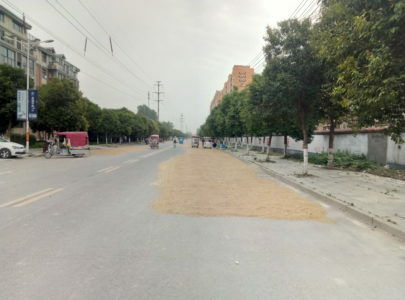 Wheat drying on the roadside in Zhoukou. With an early start, Xihua, Fugou and Yanling whizzed by. The first wheat was being harvested and dried on some highway shoulders, and the garlic harvest is still in full swing. Then I was in unknown territory. Xuchang has many grand, new buildings, whole districts are under construction. 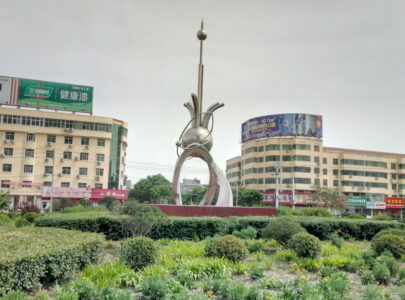 The municipal sculpture of Yanling. Xuchang is near the provincial capital of Zhengzhou. From what I’ve seen, the closer so a large city a place is, the wealthier it is. Xuchang was voted one of China’s top ten most liveable cities in 2007. 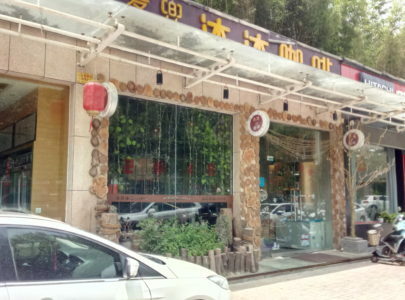 Between Yanling and Xuchang are parks, hot springs, and other tourist attractions. 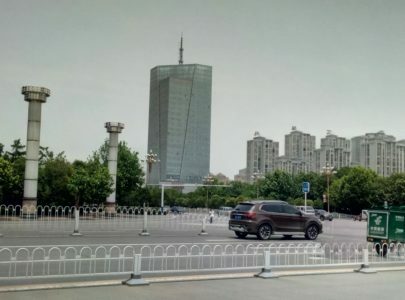 The entrance to the city is the most modern and cosmopolitan of any city I’ve seen yet in Henan. Unfortunately, my time there was cut short as I needed to get back to a birthday party in Zhoukou. After a much nicer (and more expensive!) coffee than the regular Dicos, I was on the road again, and in true form, soon fixing a flat. I haven’t done a 150 miler since Gravel Worlds last August, so the last 20 miles or so were a bit of a slog, but I made it back just as everyone was leaving for the party. It seems things had been moved up half an hour. After a quick clean-up I rode downtown and was glad not to have to take a taxi. The problem was I wasn’t sure where I was going. A bike is often quicker here and I don’t have to deal with the language barrier. The down side is that many times people can’t tell you the name or location of where you want to go. There was excellent coffee in Xuchang, but at $5.00 a cup, over priced. Westerners accustomed to taking taxis may just let a Chinese speaker say it, or show the name written in Chinese, if it has a name at all. Many seem not to be familiar with street names, which is how I locate things. I ask people to drop a pin on a map and send it to me via wechat, but not everyone knows how to do this. It seems that unless one travels under your own power here, it’s difficult to find your way around the city. Rambling Different Trails: New Roads Are Still To Be Found.